I first came acrossuranium-infused glass in the Millville Art Museum in New Jersey. They have a fine collection of tableware made with uranium-infused pressed glass. As a side note, Millville was the hub for pressed glass in the 1880s. When it was discovered that uranium could be used to create nuclear bombs, all uranium was diverted from ornate glassware to bomb making. For example, it was used in the construction of Little Boy, the first nuclear weapon used in war. Since then, uranium has rarely been used for any other purpose. A uranium atom has 92 protons and 92 electrons, of which 6 are valence electrons. 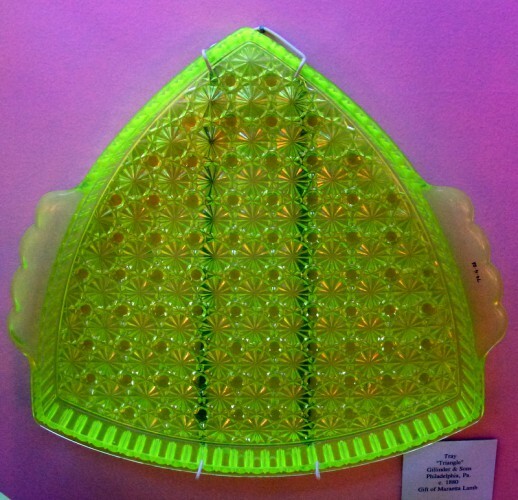 Uranium glass for tableware is nontoxic, but it does have a low geiger count. It glows under black light, mimicking the phosphor-essence of plankton. I have been using uranium-infused glass extensively at Brooklyn Glass this fall for my plankton sculptures. I think their geiger count must be pretty high by now… : ) See the below images of uranium-infused glass without and then with black light.